Nayanthara’s upcoming flick, Kolamaavu Kokila (CoCo) First Look Motion Poster was released on Monday. The motion poster has gained over one lakh views in less than a day. Written and directed by Nelson Dilipkumar, the film also stars Sharanya Ponvannan and Yogi Babu in important roles. The soundtrack of the motion poster, “Kaayam Varudhe”, has been composed by Anirudh Ravichandran and performed by Sean Rolden. It was earlier announced that the first single, “Edhuvariyo”, from the film will be released on March 8. 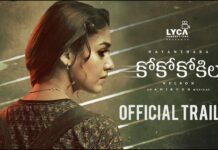 The Kolamaavu Kokila (CoCo) motion poster has images of bullets, guns, and knives in the background, hinting at an action thriller. Nayanthara is seen wearing a backpack with her head bent low. The actor is time and again proving her mettle to lead films. The Bankrolled by Lyca Productions, the film is touted to be a dark comedy. the film is touted to be a dark comedy. Lyca Productions also has a bunch of interesting projects coming up including Sai Pallavi’s Karu, Rajinikanth’s 2.0 and Dhanush’s Vada Chennai.